If today is in fact the last day Wayne Simmonds can don an orange and black sweater, he will be remembered as an all-time great Flyer. Growing up my dad (read: main sports watching companion) wasn’t a big Flyers fan, he religiously watched the Eagles and NASCAR so naturally I didn’t watch much hockey until high school. The Flyers made a deep playoff run in 2008 when I was a freshman, got bounced in the first round in 2009 and made it to the Finals in 2010. These events laid the foundation for my fandom. The arrival of Wayne Simmonds in 2011 is what took it to the next level. At the time I was attending Camden County College, trying to find my calling in life when I stumbled across their radio station, 91.5 WDBK. After a semester of interning with a DJ who liked pop music I was able to host my own show. I had a block every Wednesday morning at 11 a.m. where I would speak sports. My co-host, Cody, and I talked most about the Flyers because they were in season (and you can’t get good Flyers talk on the radio in this area but that’s a story for another time.) One of the things we talked about weekly was how much the addition of Jake Voracek and Wayne Simmonds would impact the team. Little did we know the two would become cornerstones of the team for the following eight years. Simmonds’ heart and intensity on the ice made him a fan favorite instantly. At the age of 23 in his first season as a Flyer he amassed 28 goals, tied for second on the team with Claude Giroux. In the lockout shortened 2012-2013 season he was second on the team in goals scored as well. Simmer made his presence felt in the 2013-14, 2014-15, 2015-16 and 2016-17 seasons as he led the team in goal scoring. It wasn’t just the scoring touch that made him lovable – Simmonds wasn’t afraid to drop the gloves if need be. The people in this area loved the Broad Street Bullies; Simmonds is the modern day embodiment of those beloved ’70s teams. Considering the Flyers are seven points out of a wildcard spot with 20 games left, they might be better suited to sell than buy at the deadline. This should come as a surprise to no one. 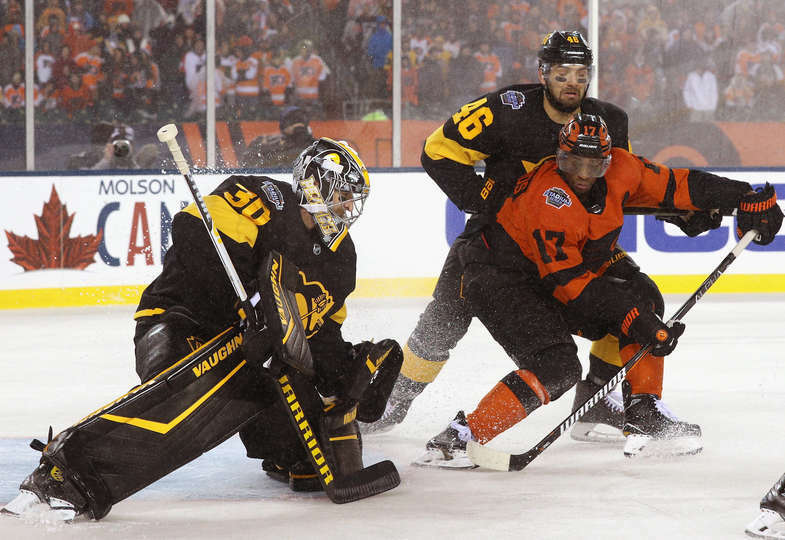 With Simmonds’ contract expiring at the end of the year he could be a prime rental target for a team ready to make a push to the Stanley Cup Final. Unfortunately for Flyers fans, they might have seen Simmer’s last game as a Flyer. As I write this I can’t help to think back to 2015 when the Phillies traded Cole Hamels. I had no outlet to write at the time as this was before I found out this was a possible career path, but I remember how I felt when I saw Hamels was traded to the Rangers. Aside from the obvious sadness, I remember feeling disappointed. Disappointed Hamels only had one ring to show for his time in Philadelphia despite making the postseason five seasons in a row. Disappointed the situation devolved to the point where the Phillies went from the cream of the NL crop to the basement at the snap of a finger. Disappointed one of my favorite athletes had to leave the city because the team had to enter a new chapter and look toward the future. I’m putting this into words because Wayne Simmonds is the 2015 Cole Hamels. I’m sad there’s a possibility he won’t be around for the end of the season, but disappointed that the team wasn’t in a better position to make a playoff push in what could be his last season in orange and black. It’s very easy to sit here and write about how “it’s the right thing to do” to trade him for a prospect and pick, but in practice it’s so much harder than that. If and when Simmonds is let go a part of the team will leave the locker room with him. While Claude Giroux is the captain of the team Simmonds is the right hand man. He has just as much of an impact on the team as G. While G is leading the team who do you think keeps him in check? I’d imagine number 17. Earlier this month I took a stab at a “stay or go” story. I said Simmonds deserves to compete for a Cup. That sentiment hasn’t changed and I don’t think that’s going to happen for him here in Philly; especially with Chuck Fletcher reportedly shopping Simmonds. I think he will be shipped to a contender at the deadline. To bring it full circle: he is the 2015 Cole Hamels. While the Flyers have some nice prospects in the farm system, as opposed to the 2015 Phillies, Simmonds could be the guy to bring in a prospect or player that will make a difference on the team for years to come. Remember, even though Jorge Alfaro wasn’t the game changing catching prospect the Phillies were looking for, they used him to land the best catcher in baseball, JT Realmuto. Just as I look back to Cole Hamels’ no-hitter at Wrigley in his last start, I will remember Wayne Simmonds at the Stadium Series game where he leveled Brian Dumoulin and set the tone for the game just as he did countless times before. That game, in the rain, at the Linc was the perfect way for Simmonds to go out, if it was indeed his last game as a Flyer. Wherever the train goes next, I can guarantee he will have the city of Philadelphia behind him. He’s left his mark on this town for sure. What’s the most iconic photo in Philly sports history?